What a beautiful day we’ve had. I awoke to a bright sliver of sunlight streaming through a gap in my blackout curtains. Motes of dust dancing in the golden light, whirling, twirling, bright against the darkness. I think I’d like to be like that, a speck of joy-filled brightness, lighting up my sphere of life. 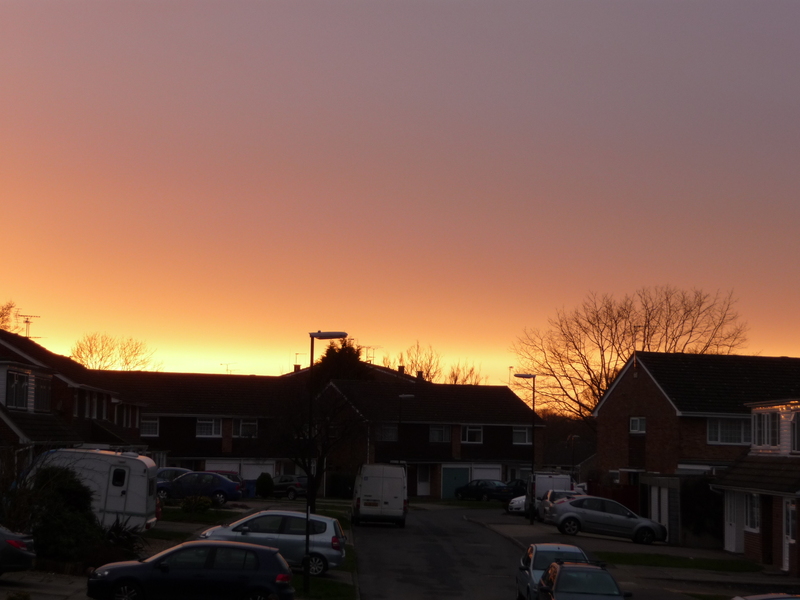 And now at the end of the day, the sun is sinking fast, a glowing orb sliding down behind the houses at the end of the street, windows like molten gold, roof edges a stark silhouette against the bright sky. But the bright sky rapidly fades to salmon pink. I can no longer see my keyboard; I switch on the light; and the day is gone. Suddenly there is the feeling of summer speeding towards us. The birds are singing, the rhododendrons and azaleas are in full bloom, and there is the faint fragrance of wisteria on the breeze. I love this time of year, the warmth of the sun on my back, blue skies, and the lazy buzz of bees in the flowerbeds. Life’s journey seems so much easier when the sun shines, when the air is warm and the long summer evenings nearly last till dawn. I’d opened my curtains this morning, and was sitting in bed with my cup of tea, reading, as I usually do. It was still cold and snowy outside, but the sky was blue, and although the sun was out of my line of sight, I knew it was shining brightly. On my windowsill are two pretty cut-glass bottles with crystal stoppers, that used to belong to my grandmother. And at the foot of the bed is a large wardrobe, with floor to ceiling mirror doors. As I was reading, I was suddenly aware of an intense brightness in the room. I looked up, and in the mirror reflection the sun was shining directly through the crystal stoppers, transforming them into golden balls of light. On the windowsill they were ordinary, but in the reflection they glowed and sparkled, and lit the whole room. I was seeing the crystal stoppers from one angle, but the mirror was seeing them from another angle, and reflecting them in a completely new and unexpected way. And both views were true representations of how the bottles and the stoppers looked at that moment in time. And it got me thinking about how we view things. We may look at something – an event, a person, an object – from one angle; but someone else may be looking from an alternate angle and see something completely different. Neither view is wrong, they are just different, and both have true value to the beholder. The sun was setting as I drove home this evening. I watched it slowly sinking, a perfect circle of molten magma in a soft pale peach sky. As I drove straight towards it, the fiery disk touched the top of the dark distant hills, and for a moment time stopped, and the edge of the sun and the line of the hills seemed to join together, one blurring with the other. But then the sun dipped further, and the harsh dark stroke of the horizon cut across it, accentuating the brightness against the pale spring sky. Like butter on a hot knife the red-gold orb slid quickly downwards, as if eager to be gone, until the merest crescent of brilliance remained. Then in an instant the last gleaming sliver was also gone, and the day was done. The empty peach sky faded and then gradually darkened to burnt mandarin. By the time I reached home, the sky was deep indigo, and night reigned supreme.